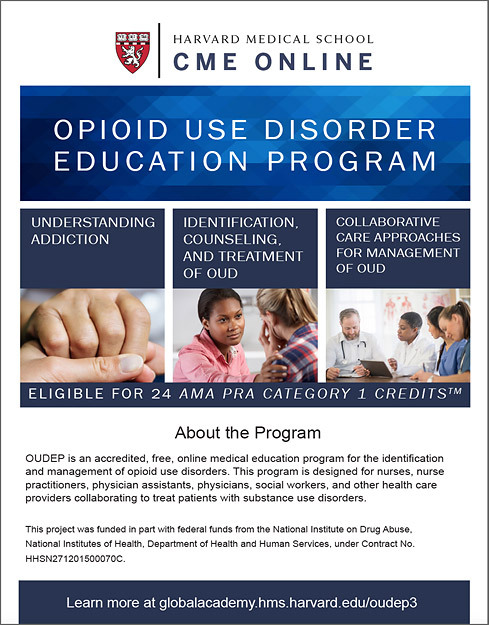 Harvard Medical School is offering free, accredited online courses in Opioid Use Disorder Education. Each of the following self-paced courses is composed of 8 units (8 contact hours) and may be taken in any order. Select the links below to learn more. Understanding Addiction focuses on the fundamentals regarding the nature of addiction including the epidemiology of opioid use disorder, the chronic nature of OUD, the differences between dependence and use disorder, and the neurobiology behind addiction. It also looks at the changing perceptions and current stigmas surrounding opioid use disorder. Identification, Counseling, and Treatment of OUD focuses on best practices and treatment of OUD with different medications in addition to psychosocial approaches. It also addresses co-occurring psychiatric disorder as well as preventing and treating overdose.